Lord's day Worship starts at 10:30. Please feel free to join us! Language used in Nagaokakyo Church is Japanese. However, we are truly looking forward to seeing you all. Nagaokakyo Church is totally unrelated to so-called heretic or cult groups such as Unification Church, Mormonism, Jehovah's Witness, and Church of Almighty God. The Lord's day Worship testimonies, all of which are in Japanese, are available on this home page. On October 27, 1974, Nagaokakyo Church, UCCJ - the United Church of Christ in Japan - was founded in Umegaoka area of Nagaokakyo city, Kyoto, Japan, as a mission branch of Kyoto Aoi Church, UCCJ. This was wholly based on the prayers and work of the members of Kyoto Aoi Church. In the first six months, there was not a single member. However, 6 members of Kyoto Aoi Church moved to this mission branch on April 6, 1975, which helped it step forward properly. For a while, it continued its mission and evangelical work mainly through house meetings, with the help of many sisters and brothers related with the Kyoto District of UCCJ including Kyoto Aoi Church. At the same time, it actively called for cooperation to Christians living in its vicinity. As a result, in June 1979, it became an independent self-supporting church; no longer a mission branch. On April 1981, it started walking as a legally registered religious organization. Furthermore, thanks to the land donation from one of its members, Nagaokakyo Church moved to the present address in 1982, and has been here since then. 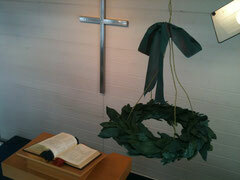 More than 30 people participate in the Lord's day worship every week. Many visitors also blow new wind into it. In addition, adorable kids give us plenty of cheerfulness and smiles. Nagaokakyo Church, while wishing to make good use of talents with which the Almighty entrusted to it, aims at being not only a church open to the community but also a church rooted in its community. Also, it is conscious that it is a part of the body of Jesus Christ, the Savior, and intends to serve the Almighty and people. This is why every month the church runs Music Salon (a concert by record player or gramophone) and Mabunekan Library (a gathering with books and games which is mainly for kids). Through these activities, it has approached people in the community little by little. In the meantime, it offers spaces to the community at large. At present, 4 groups, a total of 70-80 people, are using Nagaokakyo Church for their activities, which is truly something to be grateful for. The worship hall of Nagaokakyo Church is on the 2nd floor. Therefore, with a stair-lift called Garaventa, it maintained a chapel where anyone can gather. However, the deterioration of this equipment increased, so installing a new one became an urgent task. Because the stairs do not have enough width the present law requires, Nagaokakyo Church cannot install a new one. Therefore, it reached a consensus to install an elevator after having careful discussion. 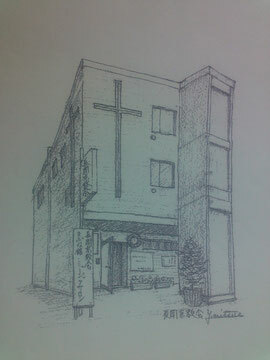 At last, a long awaited elevator has come to Nagaokakyo Church at the end of November, 2011. With this, it is now a much more accessible chapel for the old and the physically challenged. Each one of Nagaokakyo Church is weak and small. However, all of them are modestly aware that the Almighty, the creator of the whole universe, invited them to the church with his certain purpose and reason. Also, they pray to strive for the tasks of mission and evangelism entrusted by the Almighty. Furthermore, they try not to forget that Nagaokakyo Church has been built in the region, do their best to etch Jesus Christ's life and teaching into their heart, and hope to walk the way which follows Jesus Christ. Please feel free to come to Nagaokakyo Church. Why don't we support one another, and love the Almighty and people? Nagaokakyo Church is truly looking forward to seeing you all. Pastor Rev. Sooshin HAN Th.D. ◎Please feel free to contact us for further information. Replying in English as well as Korean is possible.